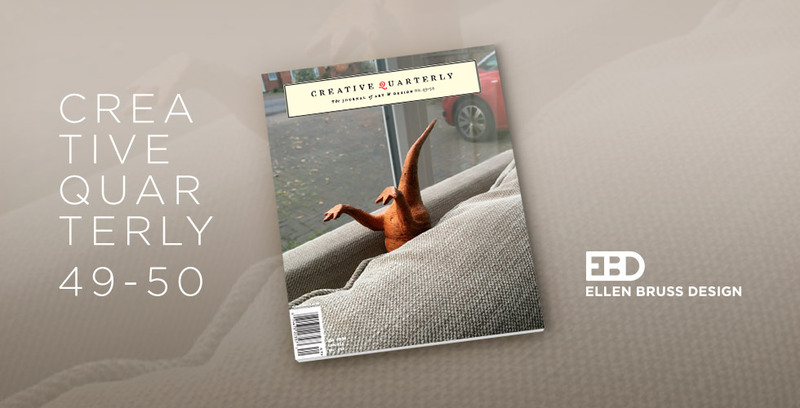 If you have your copy of Creative Quarterly 49-50, you’ll find two EBD featured projects, one of which we were our own client! 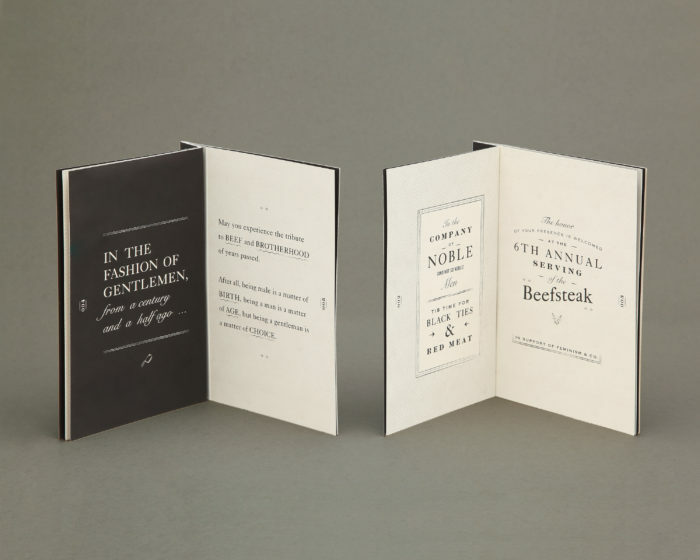 The first is our MCA Denver 2017 Beefsteak Dinner invitation, closely followed by our annual EBD client gift. A runner-up, but no less cool, was our 2017 Broad’s Banquet invitation. Even though it’s not featured in the magazine, we still think it kicks a$$. You’ll see why below. The annual MCA Denver Beefsteak Dinner is inspired by the festive Beefsteak banquets that originated amongst the working class of New York City in the mid-1800s. The meal would generally be organized to celebrate or raise money for politicians, newly promoted friends or celebrities. MCA’s version was created to celebrate all that is manly—beef, whiskey, black tie and eating with no utensils. The invitation set the tone and got invitees excited for the widespread shenanigans usually expected at this yearly event. 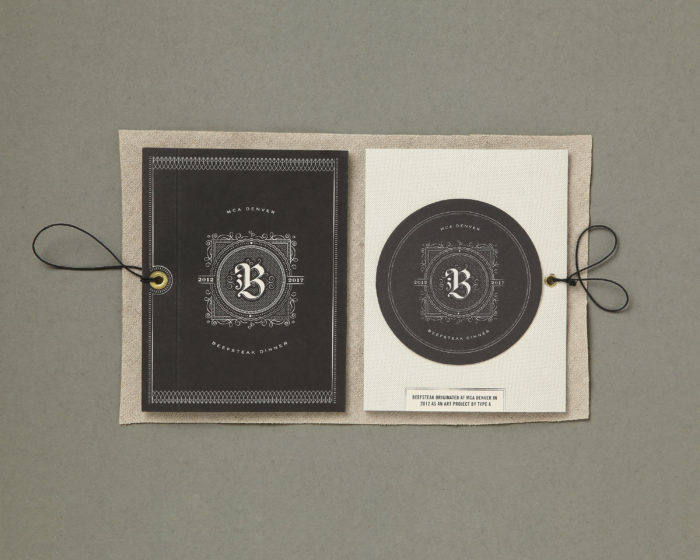 Our invitation design featured old-timey illustrations, graphics, borders and typography. 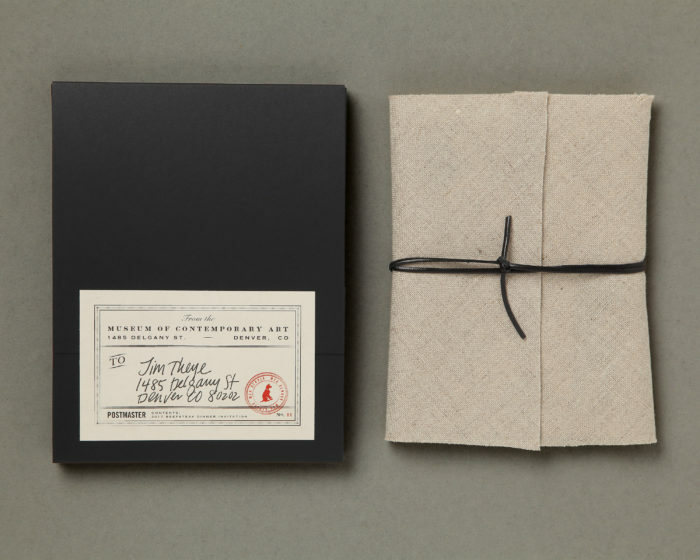 The invitation itself is made up of a small, pocket-sized booklet, bound together with one small brass rivet and an elastic band. 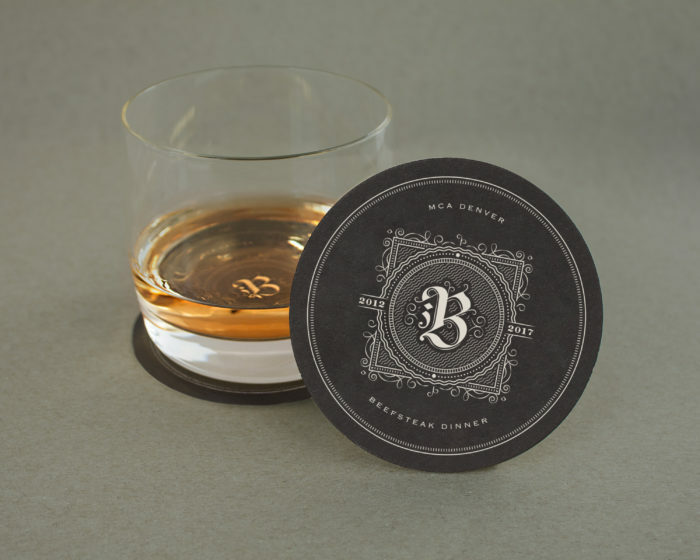 A commemorative coaster was included with the invitation, everything was wrapped together in linen, placed in a custom box, and delivered to each returning guest. Every year EBD sends out a thank you gift to our clients and partners. 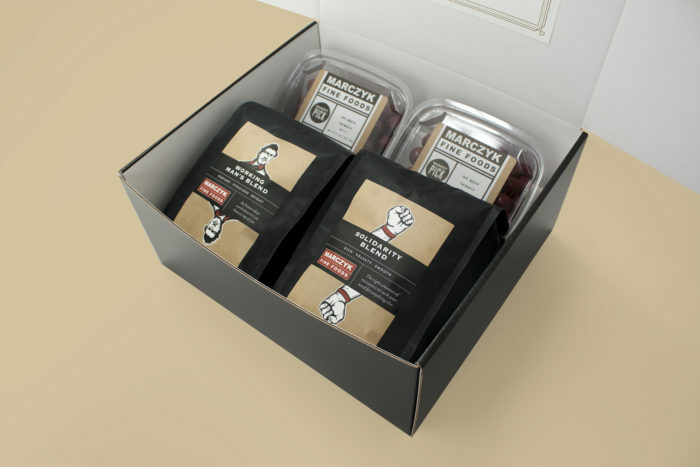 Last year, we designed a custom box and filled it with a new line of coffee packaging we had recently designed for Marczyk Fine Foods. 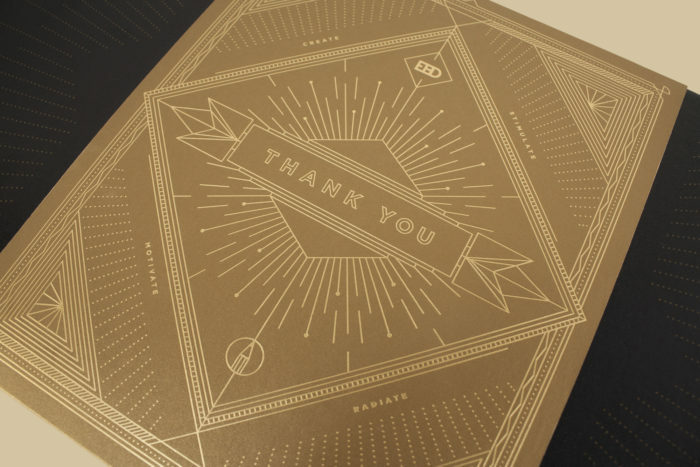 A custom printed black box was designed with copy declaring “May Your Cup Runneth Over.” The Antique Gold Neenah Stardream paper wrapped around the box was foil stamped with intricate gold details and well-wishing messages like: Create, Motivate, Radiate, Stimulate. When opened, the message “Thank you for being Caffeine Cool” displayed above the packages of Marczyk Coffee (and some chocolates for good measure!). 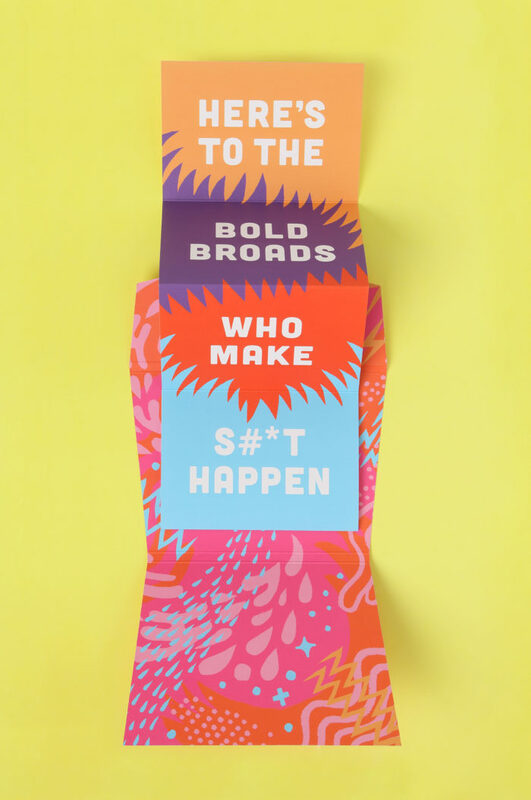 “Here’s to the bold broads who make s#*t happen.” To promote an entertaining and fun evening to celebrate women who champion contemporary art, the 2017 MCA Broads Banquet invitation promised an event which would not be the typical stuffy women’s luncheon. 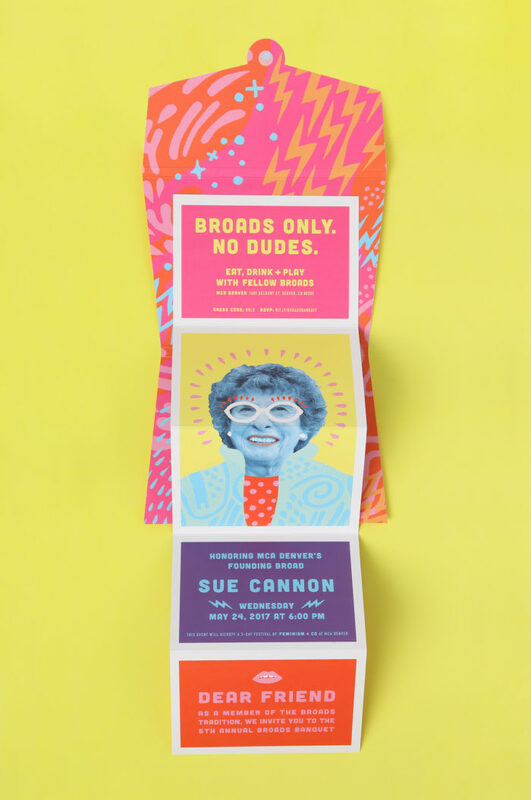 Featuring the electric colors of the 1980’s, a purse shaped invitation and an ‘Iris Apfel’ illustration overlay for the evenings’ honoree, Sue Cannon, the presentation of this invitation radiated girl power. 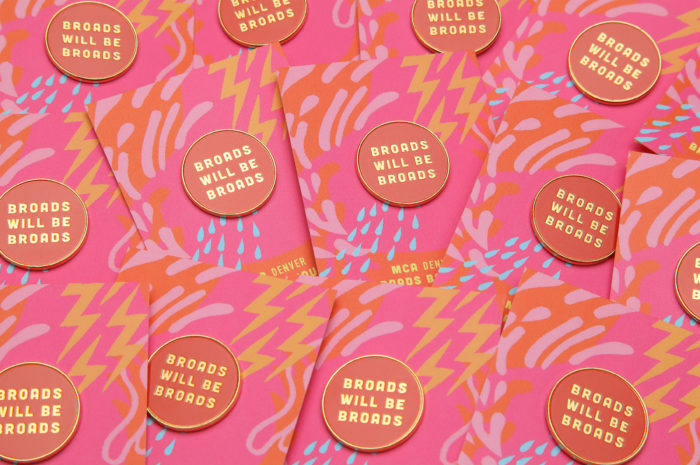 EBD encased the invitation in a hot pink box with a lightning bolt address wrapper and bright yellow paper confetti. For every winning entry, Creative Quarterly asks for a photograph of something that inspired us while working on the project. 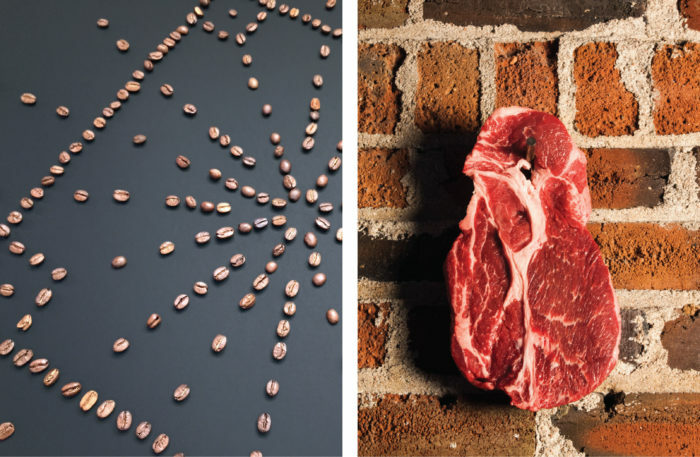 For the EBD gift box, they published this meticulous coffee bean pattern, and for the Beefsteak invitation, this raw steak hanging from a peg on a brick wall in our office. Inspiration comes from everywhere, right?